Football RPG Inazuma Eleven must have done reasonably well for itself across Europe as Nintendo has announced the sequel is on the way in 2012. 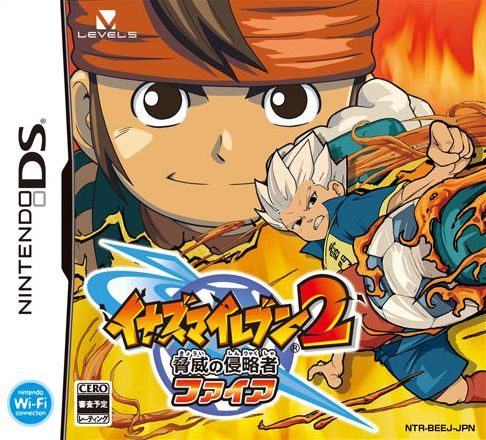 The tentatively titled Inazuma Eleven 2 is to be split into two games, currently subtitled Firestorm and Blizzard, as it was in Japan upon its initial release back in 2009. If you're not sure football roleplaying is for you — and the knowledge it's created by Professor Layton studio Level-5 doesn't do it for you — check out our Inazuma Eleven review to get you prepared for next year's follow-up. Yes! This game was an unexpected delight for me, really enjoyed it. Glad to see that the original game did well enough to get its sequel localised. Sweet! Inazuma Eleven is an awesome game & I don't even like soccer! (or any sport for that matter) I am still yet to finish it though I'm sure to pick up both versions as long as their different enough from each other. I'm with WiiLovePeace, I loved this game, even though I don't like soccer at all! I was hoping IE2 would come here! I think anyone who is complaining abou NoE can shut up now. And the first game was awesome, so I'm definetly getting this! I've got the first game at home, but haven't played it yet. These new 3DS games have gotten me occupied. I couldn't get into Inazuma Eleven. I found the story slightly odd and while I thought the matches were actually very well designed, I couldn't get my head around the stats and how they helped you beat the CPU in tackles or getting fouls. To me, it just seemed very random. And that spoilt it for me, leaving it unfinished. Wait, so Europe gets THREE Inazuma 11 games but not the Tingle sequel? I want an English version of that game! This surprises me. With the 3DS taking over from the DS, I thought they might skip the other DS games in the series and go straight to the Wii and 3DS entries in the series. That must mean the franchise touched the hearts of the Europeans, as I expected. The television series is pretty fun. However, I still have to really get into the first game. It looks and sounds awesome, but I still have to get used to the gameplay. But it will take ages for me to get back to the game. There are to many other cool games I still have to properly play/finish! "but not the Tingle sequel? I want an English version of that game!" I 300% agree! We need that game!!! As good as bought then. Darn I still haven't even imported the first one. Oh well guess I'll be treating myself this Christmas to finding one off ebay. I didn't thought the first one was going to be anything good. But it really surprised me and it turned out to be one of those games that are just so much fun. So now I have high expectations for the sequel. I won't hesitate to buy it this time!